Article first published as Blu-ray Review: The Sacrifice (1986) on Blogcritics. Andrei Tarkovksy’s final film, The Sacrifice, is a work of immense power and arresting imagery. Made as he was dying from cancer, the film wrestles with questions of spiritual commitment and the efficacy of man’s actions. Like any Tarkovksy film, the ruminations are often impenetrable, but no film that sets it sights this high should have easy answers forthcoming. The film’s photography by Sven Nykvist and its starring turn from Erland Josephson aren’t its only connections to Ingmar Bergman. Like a good number of Bergman’s films, The Sacrifice exposes blisteringly raw human emotions in the wake of spiritual anguish. 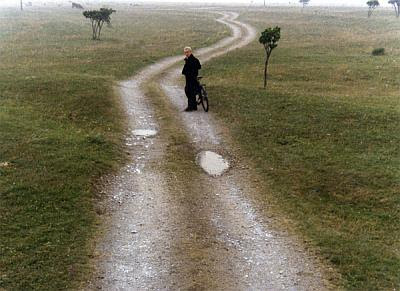 But the film remains unmistakably Tarkovskian, with his contemplative, steady pacing and slow tracking shots anchoring a story that grows increasingly mystical. Josephson stars as Alexander, the patriarch of a Swedish family living on a remote Baltic island. The film opens on his birthday as he plants a withered tree with his beloved son, whom he simply calls Little Man (Tommy Kjellqvist). He relates a story about a dead tree unerringly tended to that came to life and asserts his belief that a single action performed with conviction can have far-reaching consequences. Later, the family gathers in their home to celebrate, and Alexander is surrounded by his wife Adelaide (Susan Fleetwood), his older daughter Marta (Filippa Franzén), and mercurial mailman Otto (Allan Edwall), among others. The celebration is cut short by a TV news report declaring nuclear war to be imminent, sending everyone, particularly Adelaide, into an emotional tailspin. Here, the film shifts from colorful, natural tones to an increasingly desaturated palette, until it’s almost become a black-and-white film. Alexander cries out to God, offering himself as a sacrifice to end the madness, and Otto provides a method, telling him their maid, Maria (Guðrún Gísladóttir), is a witch. Otto claims that if Alexander sleeps with her, the crisis will be averted. Operating under this pretense, Alexander travels to her house just down the road and launches into a series of actions he believes will act as a counterbalance to the impending devastation. Tarkovksy detaches the film from reason just as subtly as he drains the color from the film itself, until Alexander has fully committed to what looks like madness as his ultimate sacrifice. The Sacrifice is sometimes baffling, often moving and always engrossing. Tarkovsky would die of cancer just months after the film was released, but this isn’t a film that signals a career petering out. Rather, it’s a forceful and impassioned artistic statement, leavened with a great deal of worry about the state of the world, but ultimately embracing the catharsis of a redemptive action. The Sacrifice is presented in 1080p high definition with an aspect ratio of 1.66:1. The film has never looked all that great on Region 1 DVD, making Kino’s superb Blu-ray release all the more of a revelation. The transfer, working from restored and remastered film elements, looks impressively film-like throughout, with an astonishing clarity of image and detail. The film’s color scheme is rather flat, even in the opening and closing scenes that aren’t desaturated, but the transfer represents them faithfully. Softness is never a problem and contrast is perfectly attenuated, with the near-black-and-white scenes showing excellent grayscale separation and superb shadow detail. Print damage is very minimal. The film looks just fantastic — easily the best you’ll see it outside of a repertory 35mm screening. Audio is presented in an uncompressed two-channel mono track that presents the mostly Swedish dialogue cleanly and clearly, with the film’s louder moments (a character crying in anguish might be the most ear-rattling) retaining fidelity and not coming off too sharp. I did notice some light crackle during a few moments, but it’s hardly even worth mentioning. The release here is a two-disc set, but it’s not overflowing with extras like that designation might have you believe. The film gets a Blu-ray disc all to itself, while a DVD disc contains Directed By Andrei Tarkovsky, a feature-length documentary by Michal Leszczylowski, who co-edited The Sacrifice with Tarkovsky. It’s a more fluid and free-form film than most making-ofs, and it presents a fascinating look at Tarkovksy’s work behind the camera and his filmmaking philosophy. The DVD also includes trailers for other Kino releases and two small photo galleries, with stills from The Sacrifice and the documentary. The film looks marvelous, and a transfer like this is essential to fully appreciating the sheer visual beauty of a Tarkovsky work.